As a high school librarian working in a district with a school board mandate for research, I use my information-literacy training to guide and motivate students during the research process. The end goal in implementing this mandate was not only to make students “college and career ready,” but to make research an innate process that students can execute with ease across all curriculum areas. Making students feel comfortable with research requires many components, and the school librarian is the main facilitator and organizer. In this educational era of Race to the Top and Common Core consortium exams, the highest emphasis is placed on outcomes, as they have a direct impact on teacher evaluations. As a result, many teachers will often forgo giving their students the in-depth experience of learning the research process in favor of devoting more time to test prep and review. In addition to the pressures of test prep and data-driven evaluations, teachers may be reluctant to take their students on a research journey because they are unsure of how to proceed in this evolving technological age. Figuring out where to begin can be paralyzing. With technology emerging at lightning speeds, students have access to a vast array of information that is literally right at their fingertips. Naturally, they are eager to explore all of these new tools from their tablets and mobile devices, most likely accessing them from the school’s Wi-Fi network in a BYOD environment. The end product of having access to a torrent of information is that many students and their teachers wind up feeling overwhelmed with frantic questions that need answers: What is considered a reputable source? How do I create a quality research assignment that will encourage my students to use a variety of sources? How do I know that student work is original and not plagiarized? These concerns are valid and can be addressed when the school librarian and teachers work together. Collaboration needs to begin when the assignment is still just an idea. With a few steps, classroom teachers, school librarians, and supportive building administrators can make the research process a productive and consistent experience for all students. Ideally, assignment creation should not occur in a vacuum. When the librarian is present at the inception of a research assignment, he or she is able to offer input on everything from what the end product should consist of to what resources are available to support the students. For example, there are certain grades and subject areas in which it is more appropriate for students to create an annotated bibliography of sources rather than a formal research paper. When the teachers provide a topic, the librarian can assist with the framework of the assignment. Once the assignment is created, the next step is to reacquaint students with the resources that are available to help them begin their search. Online databases, along with unlimited access to nonfiction ebooks (such as the ones available from Cengage Learning and Follett’s Titlewave), are a great place to begin searching. This ensures that students are locating high-quality information to use as a foundation before venturing onto the open web. When research becomes a mandate, it may become counterproductive for students to listen to the same lecture detailing how to use library resources. The concept of “flipping the library” plays a huge role in mandated research. The librarian can easily use a voice-activated screen-capture tool such as Jing to post short tutorials, giving students the option to view the videos on demand when they are in need of an assist. Flipping instruction will allow more time in class for students to ask specific questions pertaining to their own topics and to receive individualized feedback on keyword searching that’s specific to their budding ideas. This sets the tone for a confident, less intimidating research experience. The use of curation tools will allow for students to take charge of their searching and narrowing of research topics, helping them feel more satisfied with the information they find online. 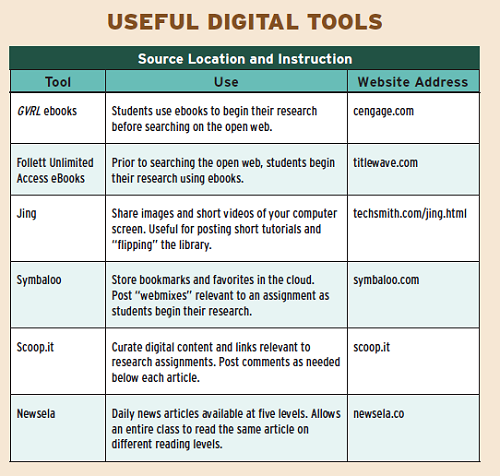 Symbaloo, Scoop.it, and Newsela are interactive tools that allow librarians to guide students toward certain web resources relevant to their chosen topics. Once students feel comfortable using these tools, they are then able to share the resources they find with their peers. Examples include storing and organizing relevant links by signing into their Symbaloo “webmix” or retrieving articles with commentary posted on Scoop.it. Since Newsela allows for Lexile-leveled options of the same article, many librarians working with special education classes will find it useful as a means to differentiate instruction. After students have gathered their sources, the next step is to begin analyzing them, taking notes, and drafting. In an age in which it is far too easy to simply copy and paste information without assessing it or giving proper credit, the emergence of citation makers helps students evaluate their sources, extrapolate information, and avoid plagiarizing. The caveat is that many of these online citation generators need to be incorporated into library instruction, thus encouraging students to think critically about their sources. On a basic level, the librarian should use a citation generator to show students how to break down a citation for various sources; however, some go beyond creating a simple Modern Language Association (MLA) or American Psychological Association (APA) citation. For example, EasyBib gives students the option of having their online sources evaluated as a starting point to help them think critically about the information they find online. This “website evaluation tool” was generated by a team of librarians who analyzed multiple criteria of credibility and determined a general rating of the overall domain for the top 5,000 websites cited on EasyBib. After students have gleaned a variety of sources, they can then use their school’s paid subscription to create note cards, linking quotations and paraphrases to a specific source in their bibliography. Notes can be colored and grouped by subject or tag and pulled into an outline all within the student’s Notebook. Other popular citation generators are NoodleTools, KnightCite, and Bedford Bibliographer. These tools present an exciting way to embark on the research journey, but it is important to bear in mind that there is no real substitute for feedback from the students’ teacher or librarian, especially as they begin drafting their assignment. Fortunately, in the digital age, there are many ways for students to receive this information. Turnitin is commonly known as a plagiarism checker; however, the use of its Grademark and Peermark features offer so much more than simply being a “gotcha” tool to catch students plagiarizing. 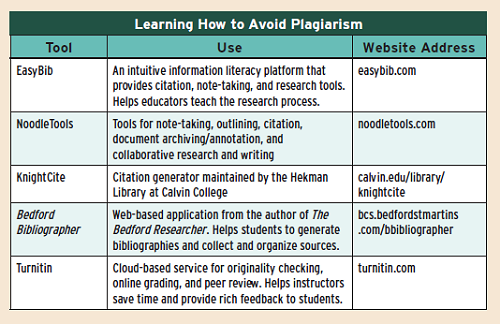 Rather, Turnitin can be used as a teaching tool to show students where they may have inadvertently plagiarized. Using the Grademark feature, teachers have the option of leaving feedback for students in written and voice-activated formats to suit an individual child’s needs. Without a mandate for research in place, students wind up having an inconsistent high school experience; some will learn the research process, while others will simply receive a taste. Students should be encouraged to submit drafts to Turnitin well in advance of the assignment due date to catch any accidental plagiarism. From there, they should work with their librarian to learn how to revise any errors. There is no point in mandating research if students will not grow and learn from their experiences; it is imperative for them to learn that revision is a huge part of the research and writing process. None of these tips can be put into practice if there is not an expectation for research-based assignments on the part of teachers. Without a mandate for research in place, students wind up having an inconsistent high school experience; some will learn the research process, while others will simply receive a taste. The steps that are outlined in the sidebar will overhaul the way faculty members, students, parents, and community members think of research and will help to establish a program in your school or district. Step 1—Invite key members to form a committee. Make it a diverse group with representative teachers from all subject areas. Include district and central administrators to gain a practical perspective on the ideas that are brainstormed. Administrators are in a position to provide answers regarding funding and implementation. Step 2—Reach out to the students: What are their research needs? Use digital tools such as SurveyMonkey or Google Forms to poll students about their current research practices. Make the survey short—no more than five questions. Be sure to inquire about the current tools they use to conduct research, their library usage, and their preferences in terms of digital tools. Post the survey in an easily accessible location on the district, school, and library homepage. Use library social media accounts to deliver the survey to students. Step 3—Draft a research guide. Compile the committee’s top recommendations coupled with student feedback. Take the top four or five recommendations and begin to draft a digital guide for students that walks them through the steps of the research process—from choosing and narrowing a topic to creating a thesis statement, outlining, drafting, and revising. Whittle the group down to three or four members who are able to work one-on-one with the librarian to generate the guide. Supplement the guide with research support materials that are librarian-generated and available in a digital format. Post these materials on the library homepage and on social media. Work with curriculum coordinators and department chairpersons to establish the times when each subject area will conduct its research. Limit mandated research assignments to two per year, each in a different subject area. You do not want teachers fighting for library time and lab resources, and you don’t want to overburden students with assignments that overlap. Step 5—Present at a school board meeting. Make this request well in advance, preferably at the start of the school year, as the agenda for each meeting is usually planned during the prior year. Use the presentation to make the mandate official. This will secure administrative support for the collaborative relationships needed to make the mandate a success, allowing for common planning time and funds to support digital resources. Step 6—Take your show on the road. When the mandate is established, promote it within the school and community. Speak at faculty and department meetings. Keep your comments succinct and to the point. Encourage teachers to ask questions. Ask a teacher who has been through the research process to speak with you. This will help to assuage fears and ensure that the support needed will be there. Connect with parents via a presentation at a PTA meeting. Another option is to offer short presentations or Q&A sessions during Back to School Night or a Parent University Night. Once the research is being implemented, continue to assess and re-evaluate the program. On a building level, the librarian should meet teachers and curriculum coordinators on a quarterly or annual basis to revise assignments as necessary. On a district level, continue to poll teachers, students, and parents on an annual basis to ascertain what is working and what needs revision. Fawley, Nancy. “Flipped Classrooms.” American Libraries Magazine. American Library Association, Oct. 7, 2014. Web. June 11, 2015. Head, Alison J. and Michael B. Eisenberg. “What Today’s College Students Say About Conducting Research in the Digital Age.” Rep. ERIC document reproduction service no. ED535161. ProQuest, Feb. 4, 2009. Web. Jan. 22, 2015. Margaux DelGuidice (metadatachick@gmail.com) is a teacher librarian at Garden City High School, where a mandated research program has been in place for more than 5 years. She is also a part-time youth services librarian, a contributing editor for Publishers Weekly, and co-author of the book, Make A Big Impact @ Your School Board Meeting. Follow her on Twitter (@metadatachick).